I was talking to a guy the other day about his tennis shoe collection - he has over 200 pairs of Nike basketball shoes. He has a special room where he keeps them and the collection is worth thousands. He went on about some of his cherished pairs and about the culture of shoe collectors. Pretty interesting. I had no idea. It got me thinking about my own collections. I really don't have many beyond my vinyl record collection that I've had since junior high. I suppose my obsession with cheap watches and fountain pens could count as collections. Along with the Japanese sake sets and teapots I inherited from my mother's estate. But that's not really a collection since I haven't added anything to it. I have a lot of art - paintings, photos, sculptures, etc. but I don't look at those as collections. I'm not purposeful about purchasing art, I see something I like and if I have the means, I'll buy it - sometimes I'll save up to buy something I really want. But I haven't been building any sort of collection. In the last few years, I've been trying to simplify and whittle down my possessions. Clear the clutter. My house is very small and it doesn't take much for things to start looking like a pre-hoarding gathering of useless material things. My records have been trimmed down from about 500 to 150 - I gave away most of them once I got onto a few streaming music services. It's not so important that I physically have the medium since all I really want to do these days is listen to the music. I kept the albums that had beautiful art or had sentimental value. I still have the first few records I bought with my own money - Rod Stewart's Every Picture Tells a Story, Bowie's Ziggy Stardust, Elton's Madman Across the Water and my Jazz Fusion phase highlighted by Mahavishnu Orchestra's Between Nothingness and Eternity and Return to Forever's Romantic Warrior. Same deal with books - I prefer digital or audio versions now and my collection is down to one shelf in the living room. My last house, where Z-girl grew up, my wife and I had two rooms filled floor to ceiling with books. When we moved, I secretly gave away or pitched a good amount of those books that I knew E would never miss. And since that time 12 years ago, I've steadily gotten rid of the books I could do without - mostly the esoteric arts and crafts books my wife collected. I didn't need 4 or 5 volumes devoted to the Art of Tatting or books on processing raw wool or building looms or mixing oil paints from scratch. Yes, THAT Vincent Price. Not only was he a famous character actor, but he and his wife were also accomplished cooks and world traveling gourmands. This book was the last birthday gift my wife gave me before she passed. So for that alone, it is dear to me, but there is much more emotion attached to this book. It is indeed a treasury of recipes, but not just any recipes. The Price's visited some of the most famous, important restaurants in the world from the mid-fifties through the 60's. It is a wonderful time capsule of reproductions of actual menus from iconic restaurants that should be known to any serious foodie or chef. There is Chef Fernand Point's La Pyramide, Paris' famed Tour d'Argent, Harry's Bar in Venice, The Amstel Hotel, Amsterdam, and The Ivy, London. There is the legendary house that Beard built, The Four Seasons, Henri Soule's La Pavillon that brought French haute cuisine to America, Locke-Ober's in Boston and Antoine's in New Orleans. The book is an incredible snapshot of a time when the Jet Set crossed the globe in search of good times and good food. The Price's did an enormous service in putting this book together and I can't recommend it highly enough. After being out of print for several decades, it has recently become available in a newly polished edition put together by the Price's daughter in honor of the anniversary of the original publishing date. Chock full of deep-dive cooking instruction and detailed, no-fail recipes, this trio of books should be handed to every student prior to their entrance to cooking school or their first restaurant cooking job. And with the advent of the internet and the wonders of YouTube, many of the subjects covered are available on the CIA channel. 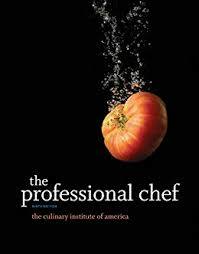 I've owned several editions of The Pro Chef and it's an event every time a new edition rolls out - THE comprehensive cookbook for professionals in America. 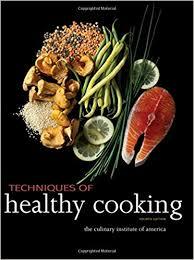 But amateurs, foodies and hobbyists can benefit from these books also - they will replace every other basic cooking tome from some celebrity chef that you own. 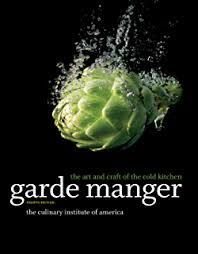 FYI - "Garde Manger" is French and refers in general to all things in cold food preparation. "Larousse Gastronomique", "Escoffier Red Book"
These are just about irrelevant in the modern age, but they serve as markers or touchstones on the culinary history timeline. 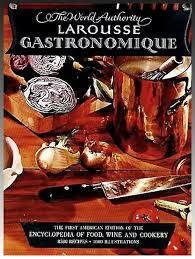 The Larousse came before "The Professional Chef" and served the same purpose - a comprehensive collection of techniques and recipes used in the industry. In the 50's, 60's and 70's. The Escoffier has recipes, but they are hardly used today and hopelessly out of date - the book is more useful in its outlining of Chef Escoffier's plan for organizing a kitchen workforce. This military style "Brigade" system is still used today in most professional kitchens. When people ask me how they can know what flavor goes with what protein or how to use a particular spice, I answer and then I refer them to "Culinary Artistry". This book lays out, with the aid of a multitude of graphs and charts, what foods pair well together, what foods are available when, and what techniques one should use to get the most out of your food. For me, this book is a book for inspiration and ideas. When I've been stumped for a dish to put into a menu, I'll flip through this book. It's full of info that will never go out of style or relevance - these are basic food truths and jumping off points which the authors play with in order to illustrate some of the creative directions a cook can explore. Jacque Pepin's "Techniques" is a classic illustrated book of every French cooking technique he learned over his long career. The small black and white pictures can be somewhat cryptic, like Ikea furniture directions, but Pepin provides very good step by step instructions. This book, along with Julia's book on French Cooking, are all the references you need about classic French cuisine. "The Art of Mexican Cooking", "The Japanese Kitchen", "The French Laundry Cookbook"
I have a multitude of what I call genre specific cookbooks - ones that dial in on one style or ethnicity of food. Here I've picked three that I feel are well organized, easy to read and have great recipes and advice. 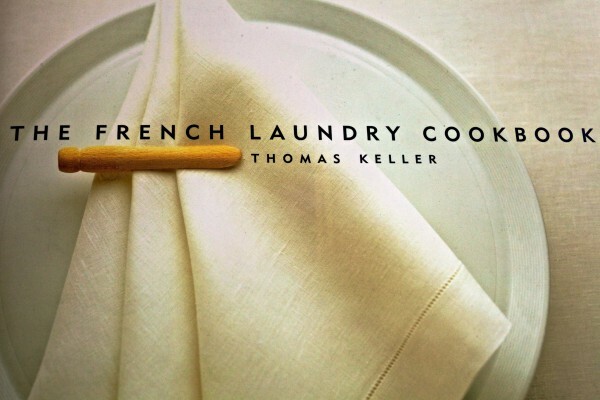 Thomas Keller's French Laundry book is a love letter to modern American cuisine - not only is this a beautiful book, but it is Keller's manifesto on his philosophy of cooking. Sourcing locally, artisinal cooking, great attention to detail and total respect for the food are hallmarks of Keller's approach. This book allows us behind the scenes at one of the best restaurants in the world for the past 20 years. 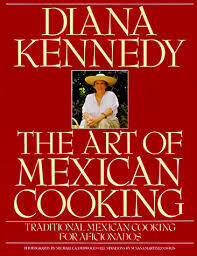 "The Art of Mexican Cooking" is Diane Kennedy's best Latin cuisine book, IMO. She covers the entire country of Mexico, cherry-picking the best, most unique dishes from each region in order to highlight the rustic beauty of the cuisine. In the decades since this book was published Mexican cuisine has exploded into an on-going phenomenon in America. Dishes that were once exotic, like Black Mole, Escabeche or Elotes, are now familiar and common fare. When I want an authentic Mexican recipe prepared in an authentic manner, I use this book as a guide. 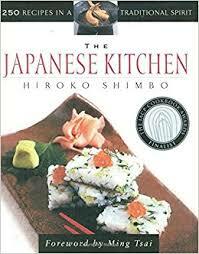 "The Japanese Kitchen" like Kennedy's book, is a short, but well organized, comprehensive guide to the subtle, complex world of Japanese cuisine. This book is as solid a primer on this cuisine as I've ever seen. Clear writing, good illustrations and great, somewhat easy recipes. The first third of the book is all about how a typical Japanese kitchen is stocked and organized from food staples to equipment. It even gives you internet sources to find the more esoteric items. I point to this book when someone asks how they can get into Japanese cooking beyond just making California rolls and Teriyaki Chicken. "Tender at the Bone", "The Apprentice"
I feel that part and parcel of a good cookbook collection should be some biographical food books. There are a lot of well written ones out there, but most of the ones I have are specific to chefs I know or I'm interested in. Books that aren't that interesting to anyone outside the industry. Marco Pierre White's "Devil in the Kitchen", Michael Ruhlman's "Soul of a Chef" or MFK Fischer's "With Bold Knife and Fork" come to mind. Anthony Bourdain's "Kitchen Confidential" is in this same vein, but it garnered broad appeal because of its particular point of view and Bourdain's snarky, gossipy and profane writing style. 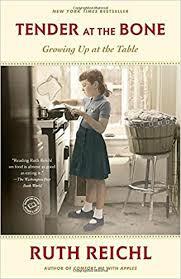 Ruth Reichl's "Tender at the Bone" is a charming, very funny, wonderful story of her growing up in a family dominated by a mother who was a terrible, but fascinatingly eclectic cook. Reichl, famed food critic and one time editor of Gourmet magazine, relates the story of her early childhood and the process of teaching herself how to cook as a survival mechanism. In the process she becomes closer and more understanding of her mother's peccadilloes and her mom even becomes a better cook herself. This book is the first in a trilogy of autobiographies from Reichl that are each different in their own ways and terrifically entertaining reads. 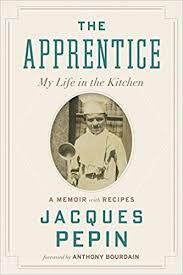 Jacques Pepin's account of his beginnings in the kitchens of France and eventual emigration to the US is straightforward and full of detail. His journey up the ladder to become one of the pre-eminent chefs in the world and a fixture on PBS cooking shows is an inspiration and a testament to his determination and hard work. Pepin is an illustration of a cook who has taken his modest amount of talent and through on the job training, shrewd career moves and a will to work hard, has taken himself as far and high in the industry as you can go. 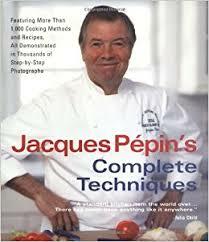 I see a lot of myself in Chef Jacques and I refer back to this book often for inspiration and advice. Lastly, besides cookbooks, there are many cooking magazines that you can buy to get recipe and technique ideas from. Besides the usual suspects like "Food and Wine", "A Taste of Home" and "Gourmet" which I've used on occasion - the two magazines that I've always looked to as useful and good sources of inspiration are "Plate" and "Art Culinaire". "Plate" is a magazine with its finger on the pulse of the current restaurant scene in America. Each issue is thematic and the publishers gather restaurants and chefs together in a particular issue that highlight the theme. 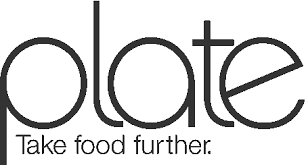 "Plate" has great recipes and is very up to the second on trends going through the restaurant industry. Since I take a lot of my cues for planning menu trends in my job from restaurants, "Plate" is an invaluable tool. For the foodie hobbyist, "Plate" will give you recipes from the best restaurants in the country to cook at home. That alone is worth the price of the subscription, which is free if you lie and tell them you work in the industry someplace. 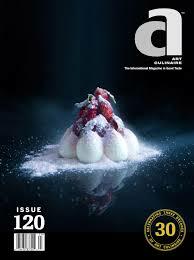 "Art Culinaire" is the mack daddy of food magazines. It comes out 4 times a year in large, hardcover form and a year's subscription is $75. All worth it. "Art" has the best photography and the best food writing. Period. 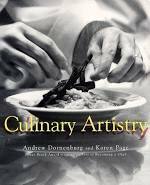 The recipes are somewhat enigmatic and geared towards highly skilled chefs. But it's the beautiful pictures of plates that are the draw. Many chefs have a hard time composing a plate to look beautiful and appealing. I had some issues with this early on, but practice and a subscription to "Art" helped me get better. It presents the cutting edge of food presentation from the best restaurant/chefs in the world working today. Many standards of presentation that you take for granted today were first illustrated in "Art" - the parsley sprinkled on a plate rim, sauce brushed on a plate as a back drop for food, powdered vegetables dusted across an entree, the balsamic squiggle - all of these appeared in "Art" long before they appeared on your plate at Appleby's. These are cookbooks from my accidental collection that I consider basics. Later on I'll write about my favorite food fiction books. If you want to own any of these books I've talked about - don't buy them new. Most are hideously expensive brand new. Go to a discount book website like Thriftbooks and buy them gently used - you'll save a lot.